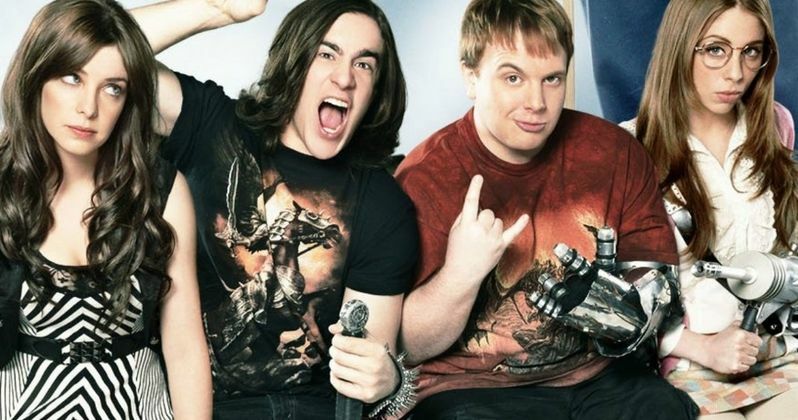 We talked to Jason Mewes this week about the release of Jay and Silent Bob's Super Groovy Cartoon Movie On Deman, and we couldn't help but bring up the cult Canadian TV series Todd and the Book of Pure Evil. The show ended after two very successful seasons, but wasn't renewed because of its high budget. This was before it caught on in America, as a new audience became attached to the supernatural comedy about a pair of high school friends attempting to keep a dangerous book out of the wrong hands. Airing on Netflix, more and more people are joining the cult of Todd as we speak. But not to worry. The series isn't completely dead. An animated movie is on the way, and will wrap up the series while leaving it open for another season or a live action movie, if enough interest demands it. Jason Mewes plays the school's janitor on the show. He explains what happened to the show, why it ended after only two season, and what the future holds for Todd and his friends. "Yes! I just did the voice over stuff. There is going to be an animated movie. That is a great script, too, man! I read it, and I was laughing out loud. It is so great! At the same time, while I am excited to see the animated movie...I think they were able to do some other things with it, because it is animation...But, man, I wish there was a season 3. Because it's such a great show. I don't know why it took so much time for the first season to get traction. I think it was nominated for 8 Geminis. Which is big. It won a Gemini for Best Comedy Ensemble. In the first season and the second season. The ratings were good. I guess it was just, from what I have been told...It was really expensive to shoot each season. So when the third season came around, they thought it was too expensive. So there won't be a season three. But there will be an animated movie. It will tie up what goes on. But again, who knows? I hope they can do, maybe, a live action movie. Or perhaps another season. Maybe it will get enough traction that they'll be able to do a couple more seasons somewhere else. Again, the movie...Like you say, this is big. Every Q&A and podcast we do, we get asked questions about it. People ask, "What happened to Todd and the Book of Pure Evil?' I feel like it's gotten its traction. People really seem to dig it now. The whole ratings system, and studios, and money...Yeah, I don't know...You would think the popularity and the awards it had, they would have at least gotten to season 3." The actor also went onto talk about how it was hard for the show to get traction in the States, as it originally premiered on Canadian television. "That was the thing. It came out on Syfy and Comedy Central in Canada, the first whole season. And then it came out somewhere in the states. It took awhile for it to get here. That's how it works. I remember with Degrassi High, it was out for a while before it got here. I assumed, I think what happened was...They didn't pick up a Season 3 in Canada. I think they gave them the option to pitch it around to some of the studios in the states. Everyone in the states said it was too expensive. But at that time, I feel like it still didn't grab its traction yet. I don't know. Again, it took some time. I hope the animated movie is out and about right away in the states. Because it's going to be fantastic!" The Todd and the Book of Pure Evil animated movie does not yet have a release date in the States.